Choose low-fat and non-fat dairy products. When you bake muffins or breads, replace part of the fat ingredient (oil, butter, margarine) with unsweetened applesauce. 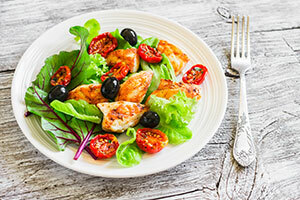 Choose reduced-calorie salad dressings or use less dressing. Try to limit soda, fruit juices and drinks, and alcohol drinks. Drink water instead.